Access to local experts passionate about their products and knowledgeable about our region. Find an overall product selection geared specifically toward our region, our sports, our climate. Local buyers hear when you ask for a specific product; it doesn’t take an annual cycle of sales trend analysis at some far-away corporate office to respond to the needs of the community. Local retailers return a total of 52% of their revenue to the local economy, compared to just 14% for national chain retailers. It’s a positive cycle–the more you buy locally, the more will be available to you locally over the long term. No need to place your order facelessly online and wait for it to arrive and hope it fits. Just stop by your local store, knowing they have what you need, say hello to your neighbor, and go about a pleasant day! Beaver Sports has a long history of collecting canned goods for the local food bank between Thanksgiving and Christmas. In 2015, we decided to expand on this idea. The response was truly overwhelming. Other chain stores and on-line retailers were promoting the idea this year of closing on Black Friday to give their employees a day off work. We chose what we thought was more in line with our customers’ expectations and the spirit of the season. “Give Thanks, Give Back” was born. We started out with mega sales on the Friday after Thanksgiving, as customers anticipated, but we threw in another element: to get the very best deals, customers had to donate. We chose three, local, non-profit organizations so customers had a choice of where their dollars went: The Fairbanks Community Food Bank (the store’s traditional recipient of donations) was joined by the Fairbanks Rescue Mission and the Alaska Dog Mushers Association this year. The Foodbank is a great group; still some wished for their dollars to go to a faith-based organization, while others wanted something related to the trails and the outdoor sports they love. So we found something for everyone. Overall, the store collected $5,016.06 with roughly a 40/40/20 split amongst the three organizations. Beaver matched that with another $1,000, split according to the same proportions customers chose in their own giving, and the results were sizeable checks for each of three great organizations to help them continue pursuing their own good work. Greg Whisenhant, the store’s owner, summed things up nicely, “The whole idea of the promotion was to encourage customers to give. We weren’t making any money on this endeavor. 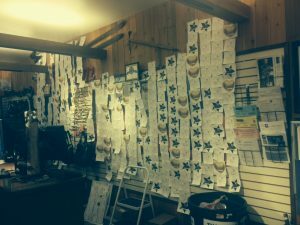 It’s just so important to our community here in Fairbanks that we are here for each other, helping our neighbors when they need it, building and maintaining our beloved trails, volunteering, and generally doing our part.” When customers donated $5 or $10, they got a star or a Golden Heart for $20 with their names on display at the cash register area, and they got 10% off their purchase. The store also accommodated those who showed up with 3 canned goods in the tradition of years past, when that was the store’s exclusive promotion–they were given 10% off as well. 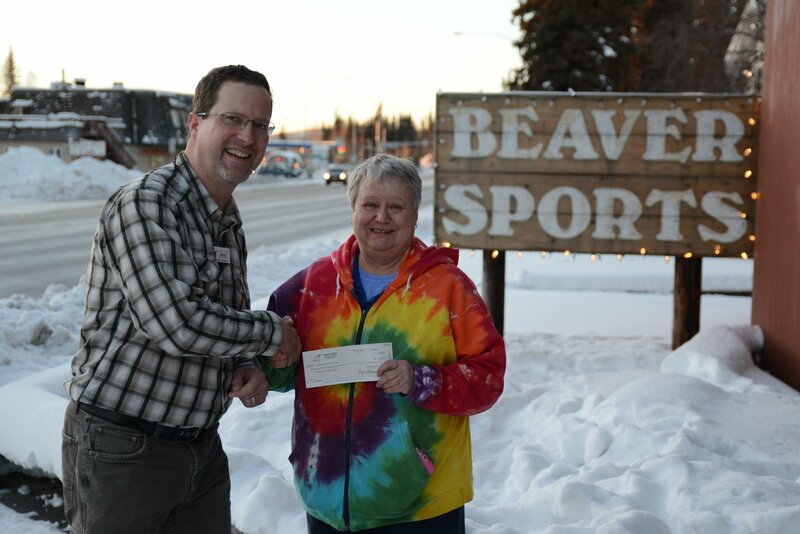 Rodney and Michele, representing the Fairbanks Rescue Mission, happily accept their check for the proceeds of Beaver Sports’ 2015 Give Thanks Give Back donation campaign. Samantha, representing the Fairbanks Community Foodbank, accepts a check for the proceeds of Beaver Sports’ 2015 Give Thanks Give Back donation campaign. The wall behind our cash registers at Beaver Sports was a Beautiful Mess! showcasing stars and golden hearts from $5, $10, and $20 customer donations towards our 2015 Give Thanks Give Back campaign.